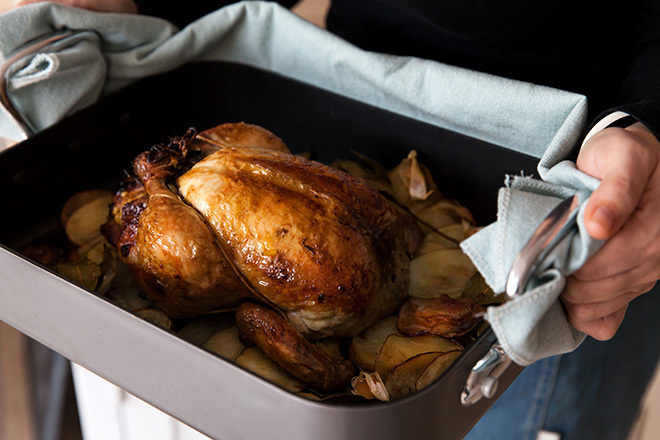 Roasting brings out the full, savoury flavours of meat and of course gives you the makings of gravy greatness but, with so many choices, finishes and price ranges, how do you choose the roasting pan that best suits your needs? The ideal pan is heavy enough not to warp but not so heavy that it can be dropped when it’s full and hot. Here are some things to consider. Metal pans (stainless steel or anodised aluminium) are great when it comes to weight. You’re after a pan that is solid and strong enough to withstand heat from the oven and the stovetop. If the pan is too heavy, there’s more of a chance of an awkward sprawl when moving from the oven to counter. Depth can affect roasting time. Too deep a pan prevents the oven’s hot air from circulating beneath the meat, too shallow could let those precious juices slosh out. The ideal depth is approximately 5–8cm as this will give you good air circulation and a gravy retaining wall height. When it comes to material, there’s a huge variety to consider from aluminium and stainless steel to stoneware, cast iron, anodised aluminium and more. Aluminium is a fantastic heat conductor but on its own, it can be lightweight. When it’s anodised aluminium, it’s naturally non-stick and the dark colour helps to brown meat as it roasts. Stainless steel has the benefit of being easy to clean, since it resists taking on marks. It also helps to create the lovely, sticky fond on the bottom of the pan, which makes for delicious gravy. Cast iron is a happy heat conductor but it can be rather heavy especially if you often roast large joints. It is efficient, hardy and, when enamelled, super easy to clean. It also retains heat well so it can keep your meat warm when used to serve the table. Stoneware, a fire-treated clay, has great heat-transferring and retaining capabilities. 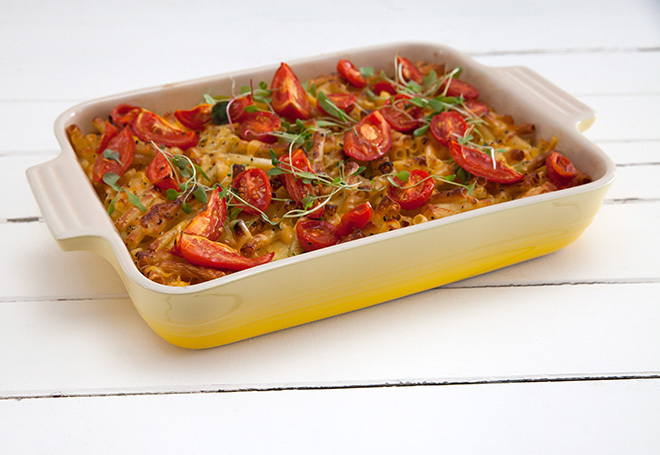 It looks great to serve in and is versatile enough for baked puddings and cakes. When it comes to size, it’s important to make sure your roasting pan is tailored to its contents. 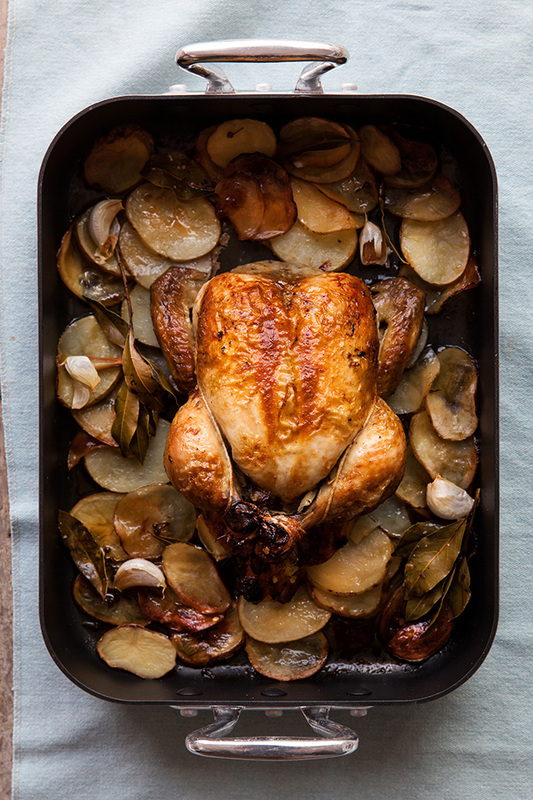 Ideally, your roasting pan should be at least 5cm larger on all sides than the meat you are wishing to roast, this ensures the roasting liquids don’t evaporate and burn, leaving you with no gravy, and possibly drying out the meat. If your pan is too small, you risk losing the gravy over the sides, either while bubbling over or upon removal from your oven. When a pan is too small, meat tends to stew in its own juices, rather than roasting. They’re great for easy meat removal after cooking. If the rack is non-stick (or sprayed with cooking spray), then the joint or skin will not stick, making clean-up easier. The rack also allows for hot air circulation during roasting, crisping the skin and even cooking. Some say the rack prevents the sticky fond from forming, and that you could get the same effect using roughly chopped root veg in the base of the pan. We think both of these work – a roasting rack is useful when it comes to removing a roast, without it falling apart and it makes drippings actually drip, allowing the meat to roast in the hot air all round, not stew in its own juices. 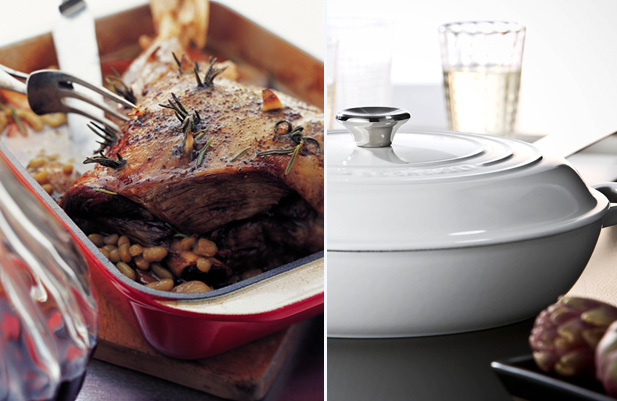 As with racks, handles have their advocates who say that without them, the roasting pan is more likely to hit the ground when taken out of the oven. Others think handles waste precious storage space. Both have merit. However, if you’re pushed for space a good pair of heat-resistant oven gloves do the trick. So whether you’re choosing a stainless steel pan with handles, a solid cast iron friend, or a pretty stoneware dish, make sure you choose the right one for your needs. What do you find is the most important part of a roasting pan?